The steel balls rotate between the slide and the rail against each other in the conventional linear guides. Relative speed at the ball contact is 2 times the rotational speed. In addition, since the contact area is extremely small, the pressure is infinite (Please refer to the formula below). This is the major reason of steel ball wearing in conventional linear slides. In BGC linear slides, oil film is retained in between the balls to absorb friction and so is more ideal for high speed. The steel balls rotate against each other in the conventional linear guides at the relative speed 2 times the rotational speed and the pressure is infinite because the contact area is extremely small. 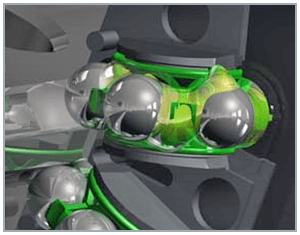 The retainer between the steel ball holds the oil and forms the oil film. Friction is absorbed by the oil film. The retainer allows the slide to move in high speed. In the BGC linear guides the steel balls are isolated by the oil film. Instead of contacting directly with relative speed twice as the rotational speed as in the conventional linear guides. Hence, the contact pressure of the conventional linear guides is a lot bigger than of the BGC linear guides. 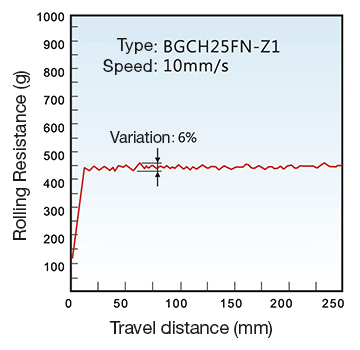 In conclusion, contact pressure and relative speed of BGC linear guides is far less than of the conventional ones and so the heat generated is less in the BGC linear guides. The lubrication oil injected from the fittings can be enhanced with the retainer circulation in the BGC linear guides. BGC linear guides surely have a longer life than the conventional, and even other caged type linear guides. 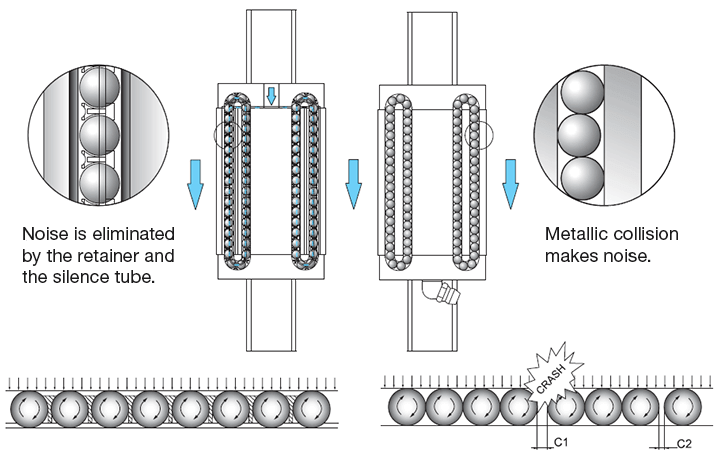 As shown in the figures above, the oil film stays in the steel balls and the retainers. The unique retainer design in the BGC linear guides contains plenty of room to retain the oil. The retainer brings the oil to the circulation surface as it circulates. The retainer even keeps the oil better than the conventional linear guide in rest. 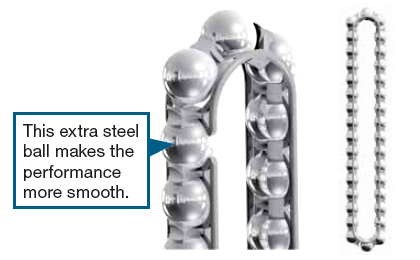 In conventional linear guides, the steel balls contact directly with one another. Therefore, the lubrication flows away easily. Loss of lubrication oil will result in wearing, noise and heating. 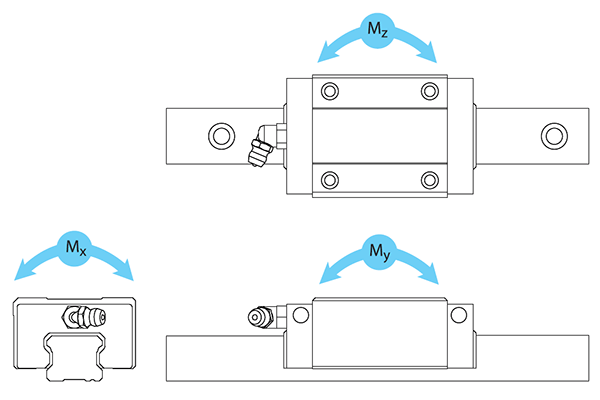 BGC linear guides provide an overall solution that can improve the performance and life. 1. Relative speed at steel ball contact is twice of that in BGC linear guides. 2. 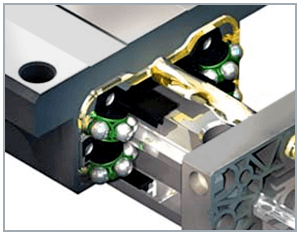 The contact area is extremely small therefore the contact pressure is far larger than that in the BGC linear guides. In the conventional linear guides, the steel ball collides with one another and gives sharp noises. In the BGC linear guides, noises are mostly absorbed by the oil film created by the retainer, therefore the noise is far milder than the conventional ones. 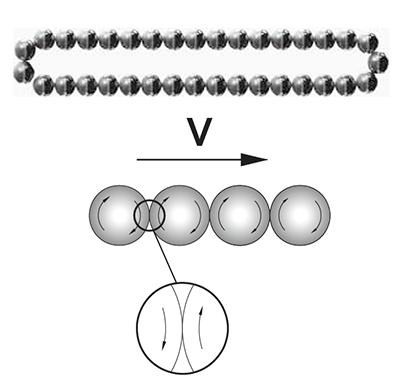 When the steel balls travels in different speeds, the steel balls will catch up the steel ball ahead. In the conventional linear guides, collision happens and creates loud noises. 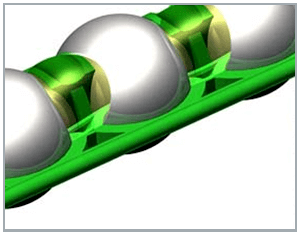 The high polymer retainer in BGC linear guides separates the steel balls and carries oil film. Most of the collisions are absorbed by the elasticity of the retainer and the oil film and so the noises due to collision are suppressed. The steel balls in conventional linear guides are not evenly arranged and the clearances between steel balls are not even. Hence the loads on individual steel balls are not even. 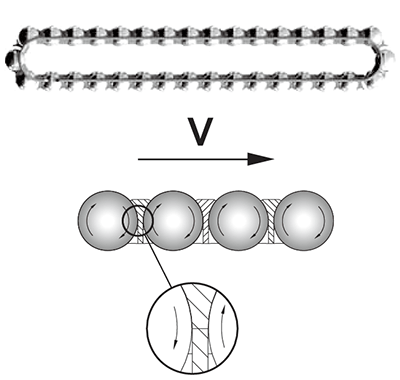 As shown in the figure above, steel ball are randomly distributed in the conventional linear guides and unevenly loaded. Linear guides with steel ball spacers, gaps of half to full size of steel balls are often found due to unfilled circulation loop. 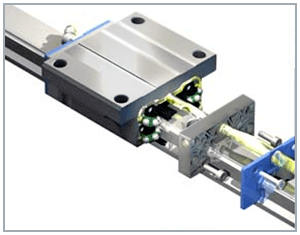 BGC linear guides provide a solution that fills this gap to arrange the steel balls tightly and distribute the load evenly which results in a uniform life. 1/6∼1/10 Vibration Amplitude in Caged Type Linear Guides. 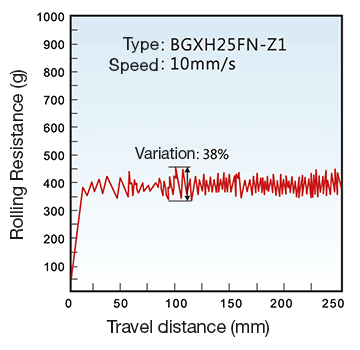 Loads calculation for linear guides differs between single-rail and dua-rail. In the single-rail system, calculating the load must consider the moment given by external force in 3 dimensions, and must calculate the equivalent load permissible moment.